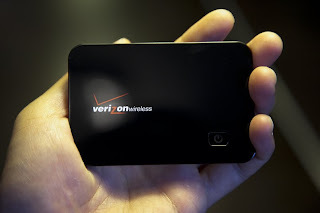 Magpie's Favorite Gadgets: CTIA Names MiFi 2200 Intelligent Mobile Hotspot - HOT! CTIA Names MiFi 2200 Intelligent Mobile Hotspot - HOT! At the 2009 CTIA Show in San Diego CA the Hottest Holiday Gifts was voted on. The Wireless Association® announced the winners for the first annual CTIA Hot for the Holidays awards program, revealing this year’s must-have mobile consumer electronics products and applications. The List was short. Only 7 products. Mobile Internet Device or Netbook Winner was MiFi 2200 Intelligent Mobile Hotspot. This technology will provide a wireless access point wherever the user go's. Remember when wireless first came out. We all thought we could go anywhere with a notebook or laptop. Well like anything else there where unexpected consequences. Everyone locked down their routers. Afraid of roaming Internet thieves. Now you just bring the hotspot with you. MiFi WiFi Mobile HotSpot features an array of features that are specific to this product, for example, the new intelligent mifi hotspot can support SMS ( texting services ) and support of a micro-usb connector. The Verizon MiFi WiFi Mobile HotSpot can support up to 5 different devices connected to this intelligent hotspot all at once, with the standard 54mbps though it may not be a good idea to do so...A great reason to buy this product is that there are many modems out there, so many you would have to swim to find the right one, but in many ways this modem is very unique in that this hotspot serves as a direct connection to the internet...that means you can have your laptop in one hand, the mifi in the other and you'll have the internet at your fingertips in no time.